Let me guess what you’ve read or heard about the Johnson semiauto rifle. I can do this because an article on them only shows up about once every twenty years, so if you’ve read any, I’m sure it’s the same ones I’ve read. Either that, or what you’ve heard was from someone who read them. They tell us it had a recoil operated action, the magazine is a rotary type holding ten rounds, and it went up against the Garand to see which would become the US’s first semiauto service rifle (they can’t resist using the term “shootout” to describe the competition). That’s pretty much the bulk of the article. They might tell a little bit about the inventor, Melvin Maynard Johnson (Captain, USMC Reserves), or maybe say it had a weird bayonet, but that’s about all the mechanical or historical detail you got. The rest is speculation and comments on it’s appearance. They almost all end with a phrase such as “…and when the dust had settled, the Garand was the new service rifle and the Johnson would become just a footnote in history”. That’s sort of how it happened. I got an M1941 Johnson a couple of years ago, and as I tend to do, I started educating myself after buying instead of before. Previously, I had read the same skimpy information that had been passed around since dinosaurs and Patton roamed the earth. I’d guess that I got as much info from my Garand reading as anything else. Since the path of the designs crossed, the Johnson is sure to get mentioned in any Garand history source. It still didn’t add up to much. If I went on what I heard from people, it was worse. It’s one of those guns a lot of people have an opinion on, even though few have owned one or shot one. Funny how it works out that most people have never so much as touched one yet fill ranges, gun shops, and forums with commentary. I’ve heard they were better than the Garand and politics is the only thing that kept them from being adopted. I’ve heard the Johnson is inferior to the Garand, cost too much to produce, and had too many easily lost parts. I’ve heard they were much more accurate than the Garand with less recoil. I’ve heard they recoiled harder than the Garand, and couldn’t shoot as well. I’ve heard the lack of a decent bayonet is the only reason the Marines didn’t buy hundreds of thousands of them. And everybody knew somebody whose relative carried one on Iwo Jima. Obviously, I’d have to bite the bullet and get one myself to see what was right. Sigh. For once, my timing was right on buying a gun. 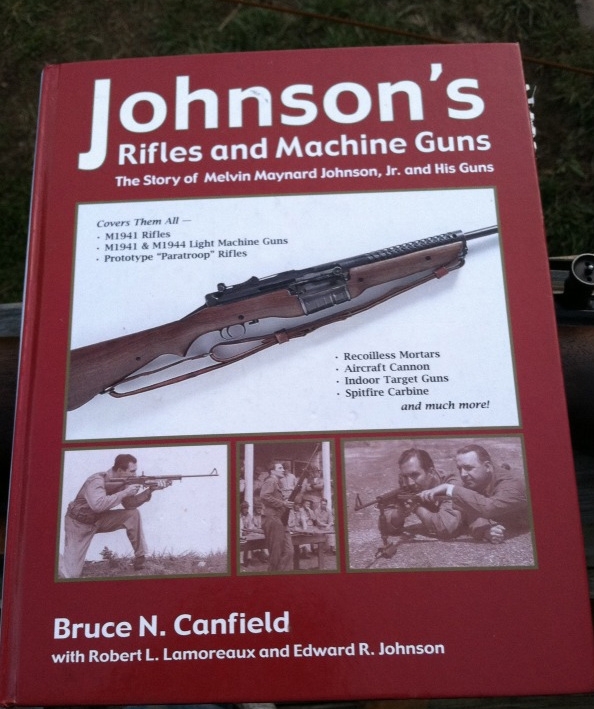 A book had come out about a year before I got mine, called “Johnson’s Rifles and Machineguns” by Bruce Canfield. The major source of information from this book came from Ed Johnson and Robert Lamoreaux. Ed Johnson is one of Melvin Johnson’s sons, and has a lot of the surviving development and production data and correspondence from the his father and the Johnson Automatics company. Lamoreaux is a big-time Johnson collector. Canfield is a collector who writes articles and books on US military weapons. Together, the three of them got the story straight and put into the book. It corrects a lot of misinformation, including some previously published by Canfield himself. Not to knock the guy, because I know the info simply wasn’t available before. But I wanted to say that in case someone remembers him as writing something I’m about to dispute here. He might have made errors before, but he made amends, that’s for sure. I want to clear up the Johnson vs Garand “competition” first. The (incorrect) story gets repeated over and over, but even a glimpse at the facts would show it couldn’t have happened the way most believe. The “shootout” between the Garand and Johnson to name the army’s first semiauto service rifle simply didn’t happen. Not that way. The Garand was adopted in January 1936, after years of development and testing by Springfield Armory and the Ordnance Corps. The adoption of the Garand in 1936 and the name “M1941 Johnson” should be a clue here. Melvin Johnson didn’t have his first working model (built in a machine shop for $300) for testing the basic action until February 29, 1936. He filed the first patent in April, 1936. The first complete prototype Johnson rifle was completed in August, 1936. The Garand was adopted eight months before there was even a Johnson rifle in existence to look at. They couldn’t possibly have been evaluated against each other before the Garand’s adoption. They were tested against each other, but later. The story got twisted because of the lack of information and people filling in the blanks. The problem is that there were so many blanks to fill in. Until the book came out, there wasn’t much documentation for collectors and writers to look at. The Garand and most other US military arms were developed by the government armory at Springfield. Every step of that process would be observed by people in the Ordnance Corps and other branches, plus members of the gun press, and be well documented and easily accessed later. The Johnson rifle was privately developed. The records, if any, would have been kept by Melvin Maynard Johnson himself, who died in 1965 at the relatively young age of 55. It just wasn’t out there until Ed Johnson, Bob Lamoreaux, and Bruce Canfield gathered it together. And people have to read it to know it. Until then, people keep repeating the same things whether they are right or not. I answered: “An M1941 Johnson”. Fascinating. Ten seconds ago he didn’t know what it was. Now he knows all about it, and all it’s faults. As the rest of us looked at each other with knowing looks, I asked: “What trouble did they have?” and never got an answer. And so it goes. Similar things happen at ranges, gun shops, and forums all over. So here is a simplified (believe it or not) story of how the Johnson rifle came to be and how it came to fade away. Melvin Johnson was a 2nd Lieutenant in the USMCR in the mid 1930s when the army was about to adopt a semiautomatic rifle. The Garand rifle was the leading contender. Being a gun hobbyist and Marine (and Rifleman by extension), and knowing the Marines would probably eventually adopt what the army did, he kept a close watch on these proceedings. Johnson was also a part of Boston’s society crowd. He was a Harvard law graduate and Boston attorney, although he seemed to devote more attention to guns than law. His father was also a Boston attorney who took his practice more seriously and was quite renowned, with plenty of social and business friends within Boston’s upper crust. Knowing all the right people, serving as a Marine officer, and being in fairly close proximity to Springfield allowed Melvin Johnson to get the inside scoop on rifle developments. And it didn’t look good to him. The Garand as it was eventually adopted had some problems. They were sorted out, but at the time, there were a lot of people with serious doubts they could be fixed before the inevitable war broke out in Europe and drew us in. Having to revert back to the Springfield at the start of war because the Garand couldn’t be fixed in time was a genuine concern. And there were a lot of things Johnson didn’t like about the Garand. He thought it was a good rifle, but not as good as it could be, and it took a different approach to what he would have used in a couple of areas. He felt the new rifle should be recoil operated. Gas operation, he thought, was too dependent on consistent ammunition that might not be available in wartime. That’s a pretty legitimate concern, and one he probably arrived at from firing surplus WWI ammunition in his youth and in the Marines. He didn’t like the magazine system either. Or the long operating rod. Or the specialized production methods it required. While looking at a 1903 Springfield one cold winter day, he came upon his basic idea of using recoil to operate the action. Apparently, he worked it out pretty quick because the period of time between getting the spark of an idea and having that machine shop test model in hand was well under two months. The bolt would have multiple lugs because that would cut the amount of rotation needed to unlock and lock the bolt to the barrel. By reducing the rotation and amount of energy needed to do it, there could be more energy left to cycle the action and it could be more reliable. He gave it ten lugs, so it needed only 18 degrees of rotation. The bolt would travel in a generally tubular receiver, and be made in two telescoping pieces with ramps on each piece to rotate the bolt. 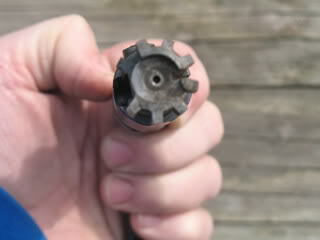 The bolt would lock into a breech collar screwed onto the barrel. This part of the Johnson rifle is very similar to the later AR-10/AR-15/M16 series. Notice the similarities to the AR10/AR15 bolt to breech lockup? Melvin Johnson worked for ArmaLite for a short time in the 50s. I think the multi-lug system was already in the AR10 design when he arrived, but that doesn’t mean he wasn’t the source of inspiration. When fired: The barrel and bolt would recoil together for a short distance, when the bolt would rotate via the cams and unlock from the barrel. 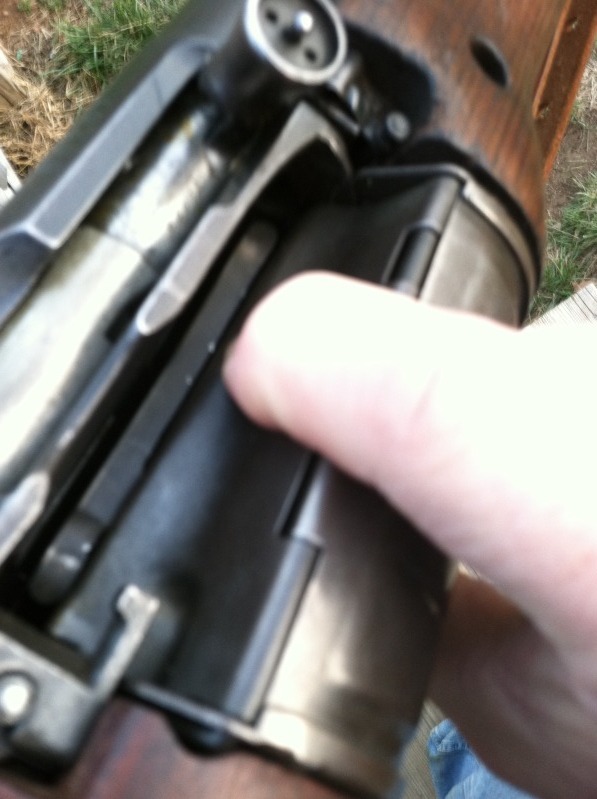 By this time, the bullet would be gone from the barrel and gas pressure would be vented to ambient. 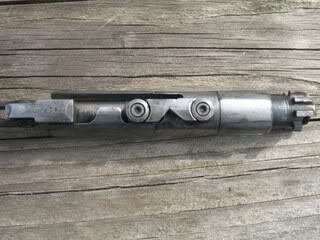 The bolt would continue back, but the barrel would meet a stop and be returned to battery by a short spring in the forend. 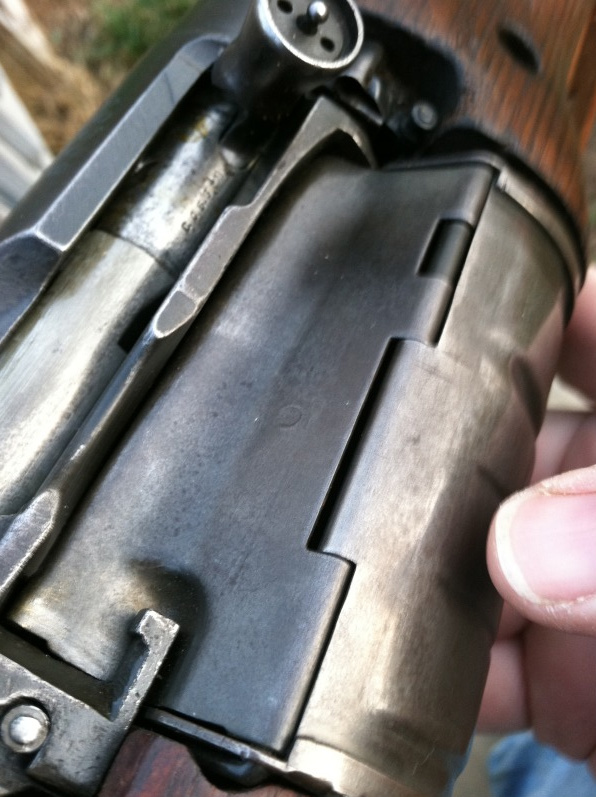 When the bolt reached the rear end of it’s travel a return spring (running into the stock) returned the bolt forward, picking up a fresh cartridge, and locking into the barrel collar by the cams. The test model was taken out into the woods and fired by a length of string. It had no magazine and just a stub of a barrel, and was made only to test if the basic action would stay locked when fired and then unlock and open at the correct time. It worked, and Johnson began forming a company and seeking investors. The first Johnson rifle was a complete rifle but not much more advanced. It was made by the same machine shop and used a 4-round box magazine. It weighed a ton because the machine shop had no means to forge items like the receiver, so they just used more metal. Although it was pretty crude, Melvin Johnson took this rifle around to anyone in the military he thought would look and listen, just to show them the basic principle he had in mind. It must have made an impression, because those officers and others began stopping in to see Johnson when in Boston to check his progress. Word was getting around. Johnson took his early rifle to Quantico in the summer of 1937 when on his annual USMC “summer camp” and demonstrated it to all who were interested. Among those who shot his rifle that year was Merritt Edson (then a major), who would figure in the rifle’s future. Later this year, Johnson hired Marlin to make some prototypes. They had three rifles ready for him in early 1938 which used modified BAR magazines. Johnson called these the “vertical feed” models. At least one of these had a one-piece stock of nicely checkered wood and was a pretty nice looking rifle. One was turned over to Aberdeen for testing. A demonstration was held at Ft Benning later that year. This demonstration had it’s good and bad points for Johnson. He felt the rifles were deliberately sabotaged by the army issuing ammunition from a lot known to have soft brass in the cases, and by army-supplied testers damaging magazines in loading. They loaded the cartridges backwards and filled them beyond capacity which damaged them beyond repair. Johnson found loaded magazines with bulging sides on the loading table. He salvaged enough magazines to run the test anyway, and over 4,000 rounds were fired. The Ordnance Department reported 86 failures. Johnson would argue for a long time these were not failures, but stoppages, and were caused by the damaged magazines and bad ammo. Bad blood remained for some time. A good thing to come out of the Benning tests was the rotary magazine. As the story goes, Johnson and some officers were sitting around the Ft Benning Officer’s Club after a day’s test throwing back some cold ones when one of the officers complained about the Garand’s magazine. He then reflected on how nice the old Krag magazine was, because it could be topped off at any time by flipping the door open and filling it up. This got Melvin Johnson thinking. Supposedly he sketched out the rotary magazine on the spot using a cocktail napkin. Look at a 10-22 magazine. Imagine that the top right portion of the magazine body has a door that hinges inward. Cartridges can be loaded individually by pressing them against this spring-loaded door, which would be pushed in like a flapper and close behind them. 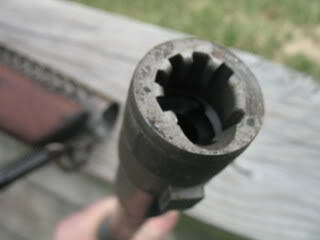 It would ordinarily be filled by using the standard M1903 stripper clip, which would align with a guide in the side of the receiver, and the cartridges would be shoved in. It help two clips’ worth, or ten rounds. Johnson wanted more prototypes built (he was developing his very similar Light Machinegun at this same time) but Marlin could not help him this time since they were already taking on military contracts and didn’t have the capacity. He turned to a firm called Taft-Peirce (yes, it’s Peirce, not Pierce). This company was an engineering firm that evaluated the production methods of other manufacturing companies. They weren’t really a manufacturer, but with war coming, manufacturers were getting busy and Johnson had to take what he could find and apparently they liked his dollar offer. It worked out pretty good because Johnson wanted Taft-Peirce to evaluate the rifle as a production item. His desire was to have it easily produced, to the point that components could be made by small machine shops all over the country if necessary. He also wanted it to be able to put into production quickly, in case the Garand failed and it was needed. It seems they succeeded as we will see later. This is a critical point, since sometimes when the Johnson rifle is brought up, an “expert” will say it was never adopted because it was too difficult or too costly to manufacture. Aberdeen tested the “vertical feed” rifle in mid 1938, again with what Melvin Johnson thought was unfair procedures. One of the magazines sent with the rifle was evidently defective, whether it arrived that way or was damaged after arrival. The rifle was sent to Aberdeen with “over a dozen magazines” but it seems clear from the Aberdeen test report that they kept using the same defective magazine over and over. Melvin Johnson thought it was clearly defective and also clearly used because of it. Rather than complete the test and carry the black mark of a failed test, he withdrew the rifle. After this test, he had Taft-Peirce make 14 new rifles- seven with the detachable box magazine, and seven with the new integral rotary magazine. In early 1939, Johnson started gaining some strong allies. He would demonstrate his rifles to anyone who would watch, mostly Marine Corp brass because he was often at Marine Corp installations and most of his contacts were Marines. He was a Captain by now. Another Marine Captain and friend of Johnson’s named George Van Orden took one of his rifles and a Garand and ran a series of tests on his own at a Massachusetts gun club range. At this time, the Technical Director of the NRA and American Rifleman magazine was F. C. Ness, who was also a friend of Captain Van Orden’s. Ness published the results of Van Orden’s test in a 1939 issue of American Rifleman. In the next issue, he published the results of his own testing and evaluation of the two rifles. The Johnson rifle received the bulk of praise. This was at the height of questioning about the Garand, and the articles got a lot of attention. I have a couple of American Rifleman magazines from that period, and Ness made it clear he was no fan of the Garand and apparently these articles followed that course. The Johnson rifle suddenly became well known, and gained a lot of support. Germany invaded Poland in September, which didn’t quiet the supporters. In December, a new rotary magazine Johnson rifle arrived at Aberdeen for testing. This would be the first serious Army test of a rotary magazine Johnson semiautomatic. It was now one month short of four years since the Garand had been adopted. The rifle was tested for 11 days, fired 1,200 rounds in shooting trials and another 5,000 in endurance testing, and was subjected to dust tests, sand tests, mud tests, drop tests, and by being jumped on while hung between two boards. The rifle had 22 stoppages. The Ordnance Department completed the tests on Dec 30, 1939 and left Johnson feeling pretty good about the results. It would be over seven weeks before the report was completed and sent to Johnson Automatics. They liked it’s overall performance, it’s accuracy, ease of disassembly and reassembly, ease of barrel removal, the magazine and the ability to top off and unload, and ability to withstand dirt, dust, sand, etc. They didn’t like the weight (half pound over desired), impaired function with present US standard bayonet (which it wasn’t designed to even accept), unreliable function with the intended bayonet attached with muzzle depressed as when firing into a trench unless rigidly held against the shoulder or hip (no kidding), lack of handguards, “safety device not foolproof” (I have no idea what that criteria would be), the effort to seat a clip of cartridges in the magazine might be excessive in adverse dust or sand conditions (again, no kidding), questioned the ability of the exposed magazine body to sustain blows, single stage trigger. Pretty minor, obvious, or special case items it would seem to me. The Ordnance Department had sent this report to the Chief of Infantry and Chief of Cavalry asking if the desired further testing. They declined. And that was that as far as the Army was concerned. Johnson and his company investors were obviously disappointed in this. However, they began receiving letters and comments from individuals who expressed their support unofficially. It seems some people within all branches of the military liked or preferred the Johnson rifle, even if they couldn’t say it out loud to just anyone. I need to point out here that from reading Johnson’s correspondence and comments in the book, I don’t get the impression he wanted to push the Garand rifle out. It seemed to me that he wanted to see it approved for use just in case it was needed if the Garand’s problems couldn’t be solved or production couldn’t be met. Ideally, he must have wanted to see it adopted as a “Substitute Standard” like the M1917 rifle of WWI. He did want “his” Marine Corps to adopt it. This was obvious. At this time, the Marines had not adopted the Garand, and had not even committed to adopted a semiautomatic rifle at all. It was clear (to Johnson at least) they would by the time we entered the war he was also sure would happen. Johnson then devoted his concentration on trying to get the Marines to adopt the rifle. The official word from the Navy Department was that the Marines had always been a “customer” of Army Ordnance when it came to small arms. This was more out of habit than any written rule though, so he continued to press it. There was no small number of Marine brass who would like to have a rifle designed by one of their own. A distraction came along in the form of a Congressional hearing. A Representative from PA named Snyder headed a report that sought investigations after questioning appropriations for a rifle (the Garand) the Army was having to rework when there was this wonderful new rifle out there. As congressmen were looking into this, the May 1940 issue of American Rifleman came out. It had an F.C. Ness article beating up the Garand. Soon, the Senate was involved with their own investigation, Johnson gained even more supporters (including the powerful Senator Henry Cabot Lodge), and some Senators even participated in a firing demonstration held at Ft Belvoir, VA. Meanwhile, a representative from TX introduced a bill to the House for the Army to adopt the Johnson rifle. This May 1940 firing demonstration was held by the Army and headed by the Army’s Garand expert who was also the officer who ran the Ft Benning tests that Johnson felt were rigged against him. The Army saw a chance to shut this thing up. But it was the first time the Johnson and Garand had ever been shot side by side, and Johnson saw it as more of an opportunity than anything. Four significant things happened at this demonstration. First, The Army brought several brand new Garands. Melvin Johnson brought only one rifle. While the Garands shared the shooting, the lone Johnson had to take it all. Second, the Army’s Garand man, Captain Brown, struggled by shooting low with the brand-new Garands early on, often missing targets completely. Third, a civilian shooter from the onlookers asked permission to shoot the Johnson rifle. He had cut his right thumb earlier that day or on a previous day. It was bandaged up, but he reopened the wound loading cartridges into the Johnson. His thumb contacted his cheek when shooting, getting blood on it. Captain Brown would make a fuss over this shooter’s cheek being “bruised and bloodied after 150 rounds” from the Johnson. Fourth, Brown with a Garand, and the civilian with the Johnson, had an informal competition. Oh by the way, unbeknownst to Brown, this civilian had competed at the Camp Perry National Matches. The “bruised and bloodied” civilian shooting a Johnson for the first time that day beat the Army’s Garand expert 472 to 436. The Congressional hearings ended with a verdict that the rifles were equals. The decision was that since the Garand was in production, there was no reason to change. And that in a nutshell was the story of how the US armed forces didn’t adopt the Johnson rifle. There was nothing wrong with it. It just arrived too late. I don’t think any honest evaluator could compare the Johnson to the Garand (after it’s problems were corrected) and say one was clearly better than the other. Being “as good as” would not be enough reason to replace the Garand, or as Melvin Johnson hoped, to supplement it. By now, the Garand had been in service for four years, after having had nearly 20 years of development and millions spent on it. For the Johnson to replace the Garand at this late stage, it would have to be vastly superior in every way. It wasn’t. When the Marine Corps did adopt a semiautomatic rifle, the war was under way and time was of the essence. They were playing catch up. They wanted a semiauto NOW, and the quickest way was to get Garands that were already developed and tested. I don’t really think it would have mattered much even if the Johnson had been obviously superior. One thing Johnson got out of the hearings was more selling points. In addition to the good showing in the first head-to-head Garand-Johnson shoot, there was the hearing testimony. One point Johnson and his congressmen supporters argued was the ease at which it could be built. Johnson had his rifle evaluated by manufacturing firms with no little or no arms-making experience to determine how quickly they could go into production on it. The VP of a manufacturer of brakes, wheels, and rims stated they could produced 200 to 300 Johnson rifles per hour. The president of an automobile horn manufacturing company said they could get into production within six months at the rate of 1,000 per day. A representative of the High Standard firearms company said they could be in production within 120 days of signing a contract and be making 500 per day within six months. Supposedly, this was one area the Ordnance Department had never even considered, which is surprising to me since Johnson had pushed as a rifle to save us if the Garand failed to meet expectations. It also flies in the face of gun shop experts who say the Johnson was passed over because it was too difficult or expensive to manufacture. The American Legion of Rhode Island did pass a resolution at it’s 1940 convention stating that the Johnson rifle be adopted as standard rifle by both the Army and Navy. The investigation/hearing ended by basically dropping the whole thing in July of 1940. But at this time, there was still the Marine hope. As all of this was going on, he was working on selling it to some foreign countries. This had been going on all along, but I get the impression that was to make it look more attractive to the Army or USMC. Nevertheless, in August of 1940, the Dutch ordered Johnsons. The Dutch government had been in exile in England after the Germans overran the Netherlands. They still had their very important colonies in the Dutch East Indies, and they wanted to protect them but needed arms. Guns were hard to get with the world going to war, but Melvin Johnson had a rifle he wanted to sell. After demonstration, testing, and negotiations, the Netherlands Purchasing Corporation ordered 10,200 Johnson semiauto rifles (and 500 LMGs). The rifle cost was $125 each. This was when the rifle got the M1941 model name: The M1941 Johnson Semiautomatic Rifle. Now he needed a factory. Melvin Johnson never wanted to manufacture rifles. He wanted to sell the designs to the government or someone else and let them do it. He had no experience in manufacturing and didn’t want any. He was already having trouble getting prototypes built because of arms makers being too busy with their own work. Taking an order for almost 11,000 guns required a solution. Johnson Automatics leased part of a closed factory in Cranston, RI called Universal Windings. The factory had made spools and other machinery used in the textile industry but closed in the Depression. It would have to converted to gun manufacturing. Barrels were to be contracted out, but nobody could take the work. Johnson had to make them too, and ordered rifling machines, which took some work because rifling machinery was on a government priority list at that time, and he obviously did not have a government contract. Stocks were contracted out. This took some work too. 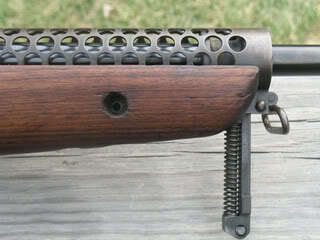 On a Johnson rifle stock, the wood bulges out at the magazine so it requires a wide stock blank. Gun stock wood was in short supply then too, and he was lucky to get any at all, let alone some that were extra wide. He managed to get standard two-inch wide blanks. The bulge was created by gluing a section to each side and machining it down. This is why some Johnson stocks now appear to be a different color at that point or are chipped at the lamination joint. When Melvin Johnson got the Dutch contract in August of 1940, he had no factory, had no manufacturing experience at all, and had around a dozen prototype rifles made by contractors. On April 19, 1941, the first production rifle was test fired. He had leased the factory only five months before. In five months time, he had leased a factory building, staffed it, equipped it during a time when machine tools were restricted, fought shortages of raw material, and learned how to manufacture military grade rifles. In the midst of achieving this remarkable feat, as if he wasn’t busy enough, he finally managed to get his rifle tested by the U.S. Marine Corps. The Marines invited Johnson to participate in a test scheduled for November 1940, in San Diego. This was to be a four week long test by the Corps to do two things. First, to determine if a semiautomatic rifle had merit for their purposes, and second, to see which, if any, of the available semiautos was superior. The rifles used would be two each of the Johnson, the Garand (some of the first after redesign of the gas system), a Winchester prototype, and the M1903 Springfield bolt action for comparison. On the six member USMC test board was Col Merrit Edson (that name again). One early test was for accuracy by firing them from standard positions from 200 to 1,000 yards. The finishing order was Garand, Winchester, Springfield, and Johnson. Much has been made of this, but there are a few items to note. The scores were close from top to bottom. From what I saw when shooting NRA Highpower matches, which is very similar to what this test was, is the participants’ scores come in “knots”, with a group at the very top, then another group about 20 points down, another 20 points below that, and so on. The score averages of the four test rifles were less than 15 points from first to last and (I think there were 600 points possible). From the commentary of the test board, and from my eye, they shot about the same and positions could have shuffled if the test were repeated. Another point is that the Johnson, while last overall, placed at least second in some portions. The Johnson was the only one with a single stage trigger, which the Marine testers were not accustomed to. This would come up several times in other tests, with negligent discharges and failures to reset the trigger resulting from this unfamiliarity. It couldn’t have helped here. And finally, the two Johnson rifles had at least 10,000 rounds each through them while the others were brand new. The Johnsons did have new barrels installed for these test, however. Because of the close accuracy results, the test board put more weight on the abuse tests. A lot of it was meant to replicate beach landings and tropical weather, with water sprinklers duplicating rain, sand drags, and salt water sprays. None worked as designed after the sand or mud tests, but only the Johnson could be operated manually. The counter to this was that the Johnson didn’t do well when all lube was cleaned off. The result of the test was that the USMC decided a semiautomatic rifle would be beneficial to their uses, and if forced to pick one at that moment, they would go with the Army’s Garand. But they did not change to a semiauto at that time. Melvin Johnson would point out that his test rifles were prototypes, while the Garands were production guns with nearly 20 years of development and a recent redesign of the gas system and some lesser refinements. Had the two designs been compared at the same stage of development, things could have been different. I think this is an important point. The Johnson rifle was a prototype designed by an attorney who had a gun hobby, and it stood up well against a rifle the government has spent a lot of time and money getting developed by professionals. And, at that point in time, it was quite an accomplishment to design a full power semiauto military rifle. There weren’t but a handful in the world at that time, and I wouldn’t say any were superior to the Johnson or Garand. He felt that if his design had even a fraction of armory development, it could be at least the equal of the Garand. I am even more sure of this, but that simply isn’t how things worked out. But it does show that he was thinking of his design as an addition to the arsenal, not a Garand replacement. The Garand had only then received the changes that had people concerned, and it was unknown if they would be successful. Johnson thought a contingency plan should be in place, or, as he put it “We should have two strings for our bow”. What is less known is that there was another demonstration near San Diego in November 1940 before the big Marine test began. Johnson was invited to an “informal demonstration” at Coronado, CA for a small number of Marine brass. This was coordinated by…Colonel Merrit Edson. Attendees were allowed to fire the Johnson rifle and LMG, but Johnson himself did the bulk of the shooting by putting on a demonstration. And he got lucky a couple of times, resulting in quite an impact. These involved the LMG, but it had an effect on the later use of both the rifle and LMG. Unknown to Johnson, the Marines had set up some human silhouette targets along a ridge at 600-700 yards, but hidden in the trees. If you didn’t know they were there, you wouldn’t see them. Johnson was demonstrating the LMG, and picked the top of that ridge as a target, walking a magazine or two of shots across that ridge’s contour to show the weapon’s control. Days later, Johnson learned about the targets when he was asked how he managed to hit them with a 12 lb MG fired fully automatic offhand! He had scored lots of hits on targets he didn’t know were there. The other surprise hit was when he demonstrated an assault on a road intersection 400-500 yards away. He ran forward and dove on the ground with the plan of firing three 20-round magazines in long bursts. When he hit the ground, one bipod leg collapsed (it was a temporary bipod adapted from a BAR) and the rear sight folded down. He fired the three mags anyway, with no rear sight or bipod support. To his surprise as much as the onlookers, all of the rounds went into the center of the intersection. Those present were buzzing with excitement over the LMG. I’m going to drift into the Johnson Light Machinegun (LMG) for a moment because it’s history captures the semiautomatic rifle along the way. The rifle was interesting, but the LMG is fascinating. It weigh 12-14 pounds depending on configuration, which was nearly half the weight of the BAR. The Marines began planning the formation of experimental parachute regiments in late 1940, aka ParaMarines. The Marine Corps Equipment Test Board sent out a request for a light, selective fire weapon with a max length of under 26 inches for parachute use. The Johnson LMG fit the parameters when broken down. The barrel is easily removed from the rifle and LMG, by popping a barrel latch, which swings down and clear. It took nearly a year before the regiments were formed and trained, and a test could be ran with the Johnson LMG. On September 19, 1941, a Marine paratrooper named Lt Harry Torgerson jumped from a plane with a Johnson LMG carried in specially-made canvas pouches. The test was the prove a method of operation for the ParaMarines. The plan was to equip half of them with Johnson LMGs and half with H&R Reising M55 SMGs. Upon landing, the SMG gunners could provide cover while the LMG gunners assembled their LMGs. Two things doomed this idea. First was that the Reising proved to be…um, lacking. Second was how quickly the Johnson LMG gunners were able to get their LMGs into action. When Lt Torgerson jumped that day, he was firing the LMG within 130 seconds of exiting the aircraft. Within 78 seconds of hitting the ground, the chute was recovered, the LMG was assembled, and he was running to a predetermined firing point, from which he hit the target 200 yards away with the first semiautomatic shot. The ParaMarines adopted the Johnson LMG. Melvin Johnson was convinced it was the informal demonstration at Coronado as much as the jump test that made this happen. And this is where the Johnson semiauto rifle comes back in. With the success of the Johnson LMG and failure of the Reising SMG with the ParaMarines, someone suggested replacing the Reising SMG with the Johnson semiauto rifle, which could be broken down as small as the LMG and probably gotten into action even faster. A ParaMarine unit could conceivably be armed completely with Johnson weapons. Johnson Automatics “lent” 23 semiauto rifles to the parachute regiment training at New River (later renamed Camp Lejune) NC for evaluation. This loan became permanent. A memorandum was sent to the Equipment Board detailing this suggested change and requesting Johnson rifles to implement it. It was from Col Merrit Edson (remember that name?) who was CO of one of the Raider units which had ParaMarines attached. The USMC Parachute Regiments and Raiders got approximately 750 Johnson semiauto rifles (around 3.5% of total production), but not through regular channels. It gets kind of fuzzy here on whether there was ever an authorization for purchase. Probably not, because in addition to limited funds, there were limited Johnson rifles to be had. Johnson Automatics’ production facilities were already stressed to produce the Dutch semiauto and LMG order and they had the USMC LMG order on top of that. But the rifles made for the Netherlands government never got to the Dutch East Indies. The Japanese were too quick, and overran the Dutch East Indies while most of their Johnson rifles and LMGs sat on a San Francisco dock awaiting shipment. Most of these were “transferred” to the USMC. This gets kind of hazy too, and records are scarce. The LMG records are better because it was an official issue, but the last I knew, there were less than 50 semiauto serial numbers actually documented to the USMC. Stories abound that when the Marines became interested in Johnson rifles and knew they were sitting on a dock, they simply went and got them. When the Marines made their first landings of the Pacific campaign on Guadalcanal in August 1942, the Raiders and some parachutists (by sea, not air) went into Gavatu, an island across the channel from Guadalcanal. Their records show they had 87 Johnson LMGs and the 23 “loaned” semiauto rifles. Those, plus whatever else they had scrounged up. Harry Torgerson, who made the test jump with the LMG, states the Johnson rifles were used by some Scout-Snipers among the parachutists in the Guadalcanal campaign. A Sgt in the 1st Parachute Rgt, Harry M. Tully, used an M1941 Johnson on Gavatu to kill 42 Japanese soldiers and earn the Silver Star. There are some who believe that because of the timing, the Johnson semiauto saw action before the Garand. The M1941 Johnson also saw use on the island of Bougainville and in a diversionary raid on nearby Choiseul Island, which was in November of 1943. Colonel Victor “Brute” Krulak, who was a well-known and decorated Marine throughout his career and became a Lt General (and whose son would become Commandant of the Marine Corps) was wounded by a Japanese sniper on Choiseul. The sniper was shot by a Marine with a Johnson. When the Parachute Regiments were broken up some time in early 1944 after the Bougainville campaign ended, they were ordered to dispose of all Johnson rifles. The Garand had been chosen before then and was becoming plentiful. Some Johnsons were “disposed” of. Some were not. Many of the parachutists went to the Raiders and other units, taking their Johnson rifles with them. Captain Robert Dunlap was awarded the Medal of Honor for actions on Iwo Jima (Feb-March 1945) and claims to have used a Johnson rifle. A statue of him was unveiled in Monmouth, IL unveiled in 1998, and he is depicted with a Johnson rifle. There are other reports and photographs of Johnson Rifles and LMGs in use on Guam and other islands in the Pacific campaign, but they saw their most use on Gavutu and Bougainville early in the war. The Dutch did get a lot of their Johnson rifles and LMGs eventually, and used them for many years after the war in their Army and Navy. The Chilean government ordered 1,000 Johnson rifles in 7x57mm. Since Johnson Automatics were busy with the Netherlands contract at the time, they could not produce the barrels and had to buy them from the Mexican National Arsenal. Navy Arms in NJ sold many of these rifles off in the 70s and 80s. I remember the ads in magazines. While everyone likes to think their M1941 rifle was used by the Marines, it’s interesting to note that the Chileans got more than the US Marines did. The Netherlands Johnson semiauto rifles got scattered. Some were captured or stolen and spread through Indochina, with reports of them being used by our enemies in the Korean War and Vietnam War. When the CIA-trained and equipped “Brigade 2506” landed at the Bay of Pigs in Cuba in 1961, they were primarily armed with Johnson semiautomatics. Many (most?) of the Dutch Johnson rifles were bought by Winfield Arms of California and resold through gun magazine ads. One of the Winfield Arms owners reportedly bought 16,000 Johnson semiauto rifles from the Dutch government in the late 1950s. Half were shipped into Canada, and brought in a little at a time so as to not flood the market. Winfield Arms sold these in various grades: A Military grade, which was essentially an unmodified rifle, for $68.50; a Standard, with a new stock and with or without a new barrel starting at $129.50; and a Custom Sporter, with new barrel, Monte Carlo stock, optional scope mount for $159.50. These were the basic models, but there were mixed changes among them, with the options in barrels, stocks, etc. Calibers offered were .30-06, .270, and 7mm…at least. It turns my stomach to think about these rifles being modified like this back then, but on the other hand, they got 8,000 Johnson rifles into the country that may never have gotten here otherwise. I am of the opinion that most of the Johnson rifles floating around in the US today were once sold by Winfield Arms. It stands to reason because of the numbers. There were approximately 21,400 M1941s made, and Winfield bought 16,000 of them (nearly 75%). With an unknown number destroyed, lost, or still floating around Pacific islands, that accounts for the vast majority of them. Mine was evidently an ex-Winfield gun. What is a mystery is if any of the second half of the Dutch rifles bought by Winfield ever got shipped. There has to be several still out there somewhere. I don’t know how many M1941 Johnson semiauto rifles still exist. I know I don’t see many. Aside from specialty military collector shows, I can count on one hand how many I’ve seen at regular gun shows. I remember seeing one at a range (at a Highpower match no less), and never saw that shooter again. Since they are so similar, some semiauto rifles previously “sporterized” were turned into semiauto replicas of M1941 and M1944 LMGs. One thing I have wondered: If the M1941 Johnson had been adopted by part of the US military, would things have been different in postwar military small arms development?